New York : Crown Trade, c2011. William E. Dodd was an academic historian, living a quiet life in Chicago, when Franklin D. Roosevelt appointed him United States ambassador to Germany. It was 1933, Hitler had recently been appointed chancellor, the world was about to change. Had Dodd gone to Berlin by himself, his reports of events, his diary entries, his quarrels with the State Department, his conversations with Roosevelt would be source material for specialists. But the general reader is in luck on two counts: First, Dodd took his family to Berlin, including his young, beautiful and sexually adventurous daughter, Martha; second, the book that recounts this story, “In the Garden of Beasts,” is by Erik Larson, the author of “The Devil in the White City.” Larson has meticulously researched the Dodds’ intimate witness to Hitler’s ascendancy and created an edifying narrative of this historical byway that has all the pleasures of a political thriller: innocents abroad, the gathering storm. . . . In the Garden of Beasts documents William Dodd’s term as U.S. ambassador to Germany -- primarily his first year, beginning July 1933, and primarily as it relates to Hitler’s ascent from newly appointed chancellor under President Hindenburg to leader of the Nazi regime. Like Larson’s other books, the story is presented via alternating threads -- one following Dodd, a quiet history professor and writer who was Roosevelt’s nth choice as ambassador; the other following Dodd’s 24-year-old daughter Martha, whose appetite for parties and romance put her in the milieu of top German officials. Dodd’s frugal, intellectual personality made him uniquely unsuited to the lavish, schmoozing life of a diplomat, and his State Department colleagues’ disrespect for him led them to largely ignore his growing concerns about Hitler. Combine that with the Germans’ own frank disbelief; America’s desire for isolationism after WWI and its desire to not anger Germany before their war debt was paid; and the Depression’s damper on immigration (including Jews trying to flee Germany) and a picture develops about why Hitler’s growing menace was ignored until too late. Erik Larson is king of the "nonfiction for fiction lovers" genre. Who didn't like The Devil in the White City? His latest book, about the first American ambassador to Nazi Germany, is more serious in intent, but just as much of a page-turner. William Dodd is a dry, plain, somewhat puritanical man and his daughter Martha is a free-spirited adventurer temporarily infatuted with all the beautiful Aryan men surrounding her. Dodd grows to be one of the early voices warning against Hitler, when the U.S. mood is isolationist and the State Department includes its share of outright Nazi sympathizers. Dodd is not particularly well-liked or successful in his job. Martha affronts the stodgy diplomatic community with her series of affairs. The book deals glancingly with the oppression of Jews; it goes in more depth about the internecine battles among German officials, including a harrowing account of the Night of Long Knives. IN THE GARDEN OF BEASTS by Erik Larson, author of DEVIL IN THE WHITE CITY, is the nonfiction story of the Dodd family in Germany, pre-World War II, beginning after Hitler came to power there. The Dodds are Americans, William, the ambassador to Germany, with his wife and two adult children. The accountings are largely taken from or based on the writings of William and his daughter, Martha; Larson also adds background so the reader is aware of of what the Dodds’ wittness. When he was offered the ambassadorship, William had been looking forward to having extra time to spend on his farm in Illinois and to work on a book he was writing. Instead, he and his family were transported to Germany, totally unaware that this was a new Germany, not the same place it was when William lived there years before. Gradually, so gradually it was maddening, he came to wonder if everyone there had gone mad, how there could be all around him such a "strange indifference to atrocity." After the Dodds' first year (1933 to 1934) in Germany, William was struck by the "willingness of the populace and the moderate elements in the government to accept each new oppressive decree, each new act of violence, without protest. It was as if he had entered the dark forest of a fairy tale where all the rules of right and wrong were upended." Martha was also slow to accept that she was witnessing evil. Long after she should have known better, she was happy to see that Germany was only trying to better itself. So she enjoyed herself: as a 24-year-old divorcé, she partied often and had affairs with several men, one the head of the Gestapo, another an official from the Soviet Union. In the meantime, William, new to government work, came to be disliked by many other American government officials and representatives, in large part for his frugality and his criticism of their lack of it. At a time when most Americans were living with or just getting over the Depression, the American representatives in Germany had servants, cooks, chauffeurs, mansions, and new clothes for every occasion. Of course, they shot back with their own criticism that William’s frugality was possible at the expense of the Jewish man who owned the home the Dodd’s were renting so cheaply. And once he took off his own blinders about the state of affairs in Hitler’s Germany, William also came to be critical of America for being so unwilling to acknowledge what so many witnesses were reporting, so unwilling to criticize the new Germany. Larson, himself, poses this question when it was still 1934:". . . why were the State Department and President Roosevelt so hesitant to express in frank terms how they really felt about Hitler at a time when such expressions clearly could have had a powerful effect on his prestige in the world?" After Larson's superb Devil in the White City, I was greatly looking forward to In the Garden of Beasts. Largely following the American ambassador to Germany during Hitler's rise, up to about the start of World War II, it is written in the style of his other books: that is, in the form of a novel, yet completely non-fiction. The problem is, ambassador William Dodd himself is not a terribly dynamic character. He took the post out of a sense of obligation, but never relished it. His response to growing violence and all around nuttiness by Hitler, Goering, Himmler, and the rest of the fun bunch was to basically avoid them when at all possible. There are some attempts to explain policies of appeasement, but they are half-hearted, and not make any substantive indictments. The parallel story of Dodd's daughter's romantic saga disinterested me completely. What I wanted to hear about was personal stories about interactions with principal figures of the Nazi regime, and there was tantalizingly few. Dodd observed the transformation of unlikely political leaders into the monsters they became, but when the killing starts, him and his German friends do their best to fade into the background and not call attention to themselves. A wise decision, and many of these associates lived long lives. One of Larson's best. He weaves a great tale out of the life of an obscure ambassador during the rise of Hitler. Some questions unanswered: Why no mention of the 1936 Olympics when Hitler was upstaged by Jesse Owens? What happened to the Jewish family living in Dodd's Berlin residence? 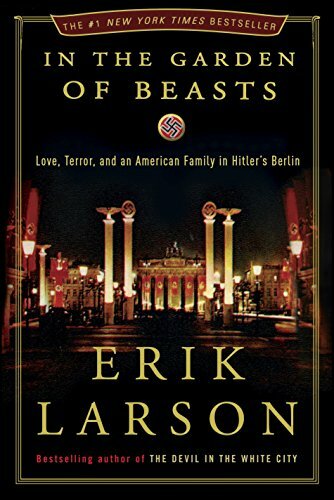 In The Garden of Beasts by Erik Larson is a straight forward, exceedingly well researched, and engagingly written history of an American ambassador, and his family, in Berlin at the beginning of Hilter's rise to power. Both the Ambassador, William E. Dodd, and his daughter, Martha, are fascinating people and in some ways their interesting characters make the book read more like a novel than a history book. Larson succeeded in making me love the Dodds and their impossible mission in pre-WWII Berlin. Martha was a lively, jazz aged young woman, hell bent on having a good time and throughout not spending too, too much time thinking. She begins by admiring the Germans and this "new" government, and she ends up hating them, and flirting with communism as a kind of antidote, I think. What would it be like to rub elbows with the higher-ups of the Nazi party before everyone knew what they were really like, what they were really doing? That's the question Larson tries to answer in this account of the experiences of US Ambassador to Germany William Dodd and his family. They were in Berlin from 1933 to 1937, before the names Goering and Goebbels became shudder-inducing to the general public. Dodd himself was pretty one-note; suspicious of the German government's intentions and unpopular with his peers and superiors for his criticism of the wealthy "old boys'" club of the diplomatic community. His daughter Martha was a free spirit before it was anywhere near acceptable, and she spent her time gadding about town with romantic partners who were completely unsuitable for the daughter of a diplomat. Summary: In the Garden of Beasts tells the story of the build-up to World War II from the point of view of people who experienced it first hand: the American ambassador to Germany in the 1930s, and his family. William Dodd was a history professor by training, not a diplomat, and may have seemed an unlikely choice for the representative of U.S. interests in Germany during such a pivotal time. Arriving in Germany a few months after Hitler was appointed chancellor in 1933, Dodd and his family, particularly his lively socialite daughter Martha, had a front-row view of the building popularity of the Nazi party... and the growing climate of suspicion and fear that was slowly co-opting the glorious vision of "New Germany." Review: Once again, Larson proves himself to be a writer with an eye for the untold stories of history, and the skill to bring those untold facets of the past to vivid life. So many pages have been written on World War II, both fiction and non-fiction, that it's hard to imagine each new author finding a new perspective to write about, but Larson does it, and does it with style. Perhaps it's because he reaches further back in history, focusing on the rise of the Third Reich and the slow build to war, rather than on the war itself. And by focusing his story on a family who was themselves out of place in Hitler's Germany, he gives the readers easy access to the unfamiliar parts of his tale. I was engaged and fascinated throughout, even though political history writ large has never really been my thing, perhaps because by blending the history with a biography of William and Martha Dodd, everything seemed much more immediate and alive. I did enjoy Martha's sections more than William's (despite not particularly liking Martha as a person), as they're more personal and lively, whereas some of the diplomatic politicking in William's story got a little tedious, even in Larson's hands. There were a few places I had problems, though. First, Larson's trick of building dramatic tension by ending every chapter with vague but ominous pronouncements about characters or events (ominous pronouncements that, more often than not, were not brought up again until they were resolved in the epilogue) got very tiresome by about halfway through. It's an effective tactic for driving your reader onwards, but it's overused, and I thought the story had enough drama on its own merits without needing to artificially create more. I also found the pacing strange, especially near the end. The bulk of the book is spent on the Dodds' first year in Berlin, told in occasionally day-by-day detail. Then, very abruptly, Larson starts covering large swaths of time in single paragraphs, so that Dodd's remaining three years as ambassador take about as many pages as a week or two from the early part of the book. While I can understand why Larson chose to condense time the way he did, I still found that it pulled me out of the story, and took me a while to get settled back into the rhythm of the storytelling again. 4 out of 5 stars. I've said this before, while its important that we learn about this material in school, we're being fed information at a time when we just don't care. I was in class in high school when we were introduced to some of the harsher subject matter of the second World War.. but I just didn't care. As sad as that is, I was more concerned about getting home on Friday afternoon, switching on my Nintendo 64 and enjoying some Goldeneye or whatever the hell I was playing at the time. World War II had ended 50 years prior to when I was in the eleventh grade and I had no way to fathom it. However, now that I'm a little older, a little wiser (allegedly) and a little more willing to explore history, I've gained an interest in the past and how we got to this point. Since high school, I've watched more than a few movies about WWII (Schindler's List, Saving Private Ryan, Inglorious Basterds, etc.) or generally that period in history. Now, I'm like some Nazi sponge (to clarify, I'm not a Nazi product myself.. I just can't get enough information about that awful group of people) - I find it just mind blowing. The book looks at the life and observations of an American family living in Berlin during Hitler's rise to power. It's just stunning how almost everything he proposed was passed; stunning that a civilization would turn so quickly on a segment of the population. Hitler was truly a monster (not that I needed to tell you that) and Larson does a fine job building the atmosphere that any foreigner would be uncomfortable experiencing at the time. Narrative non fiction is a fantastic genre. This being my first real experience with it, I'm interested in reading some more. Larson seems to have a pretty impressive cannon of material for me to check out, so I shouldn't be without it for long. Who doesn't want to start the year with a book about pre-WW II Nazi Germany? I mean, what better way to ease into an attempted double cannonball? Despite the subject matter, this book is not a challenging read. I read Mr. Larson's book about the Chicago World's Fair (Devil in the White City) either last year or the year before and found it to be good but tough to get through. This book flowed better, although it didn't really end. I mean, obviously, it did, but it felt more like I was reading a very long and exquisitely researched magazine article than a book with a narrative arc. In the Garden of Beasts follows the U.S. Ambassador to Germany from 1933-1934. William Dodd was a history professor in Chicago when he was asked by President Roosevelt to serve; he brought his wife and two adult children with him to Berlin. The story follows Mr. Dodd and his daughter Martha as they navigate Nazi German, when Hitler was Chancellor and there was still a President who was ostensibly in charge. The main point of the book is that Dodd wasn't the typical old boys club rich kid ambassador and as such was a bit less interested in the economic issues that the U.S. State Department wanted to address and was more concerned with what was going on with Hitler, the SS, the SA and all the players who we now know were instrumental in WW II and the Holocaust. I have not read a book on WW II or the Holocaust since Diary of Anne Frank, so I can't claim that everything in the book is wholly accurate, but Mr. Larson is known for writing truthful and well-researched historical non-fiction by telling the stories of the people involved, so I assume it is mostly correct. I'm not sure if I really learned much new by reading the book. I suppose I learned that the U.S. government was primarily concerned with getting back money from Germany as opposed to the oppression and murder of German residents. But I wasn't surprised to learn that. It sort of matches the priorities the political elite have always had: money first, then people – maybe, eventually, if there is time. With “In The Garden Of Beast,” Erik Larson once more immerses his readers in the lives and times of his focal characters, Ambassador William Dodd and family, as they make their way from their peaceful, academic life in Chicago to the emerging caldron of pre-Nazi Berlin. Living within walking distance of the Reichstag, Ambassador Dodd is witness to Hitler’s manic drive to power and among the first to recognize his ultimate goal. He is also the first among many to be ignored as “the new Germany” frantically rearms and prepares to dominate Europe. Like David McCullough, Larson writes living history in which the reader is absorbed into the facts and the feel of the events unfolding on the pages. Rife with details and personal accounts, “In The Garden Of Beasts” has the literary flow and drive of a well-crafted political thriller. A wonderful read in which the reader, while generally knowing how things evolved, keeps hoping the ending will somehow change; that the “night of the long knives,” Dachau, or Auschwitz won’t happen. But they do happen, and this time, the reader is witness as the atrocities, large and small, take root. (nonfiction) William Dodd just wanted some quiet time so that he could finish his planned multi-volume work about the Old South. He thought that a position as the US Ambassador to Germany in the relative calm of post-Great War Germany would allow him plenty of time to write. What he didn't know is that Roosevelt had asked several men before him to fill the position, and all had refused. And he didn't know how much power the new chancellor, Hilter, was gaining in Germany. This is one of countless books about this dark period in time, and some have questioned if another one was needed or wanted. What makes one this different is that it focuses on Dodd and his battle as ambassador, and on his daughter, Martha, his adult daughter who also went to Germany with him, along with Dodd's wife and adult son. What I found surprising and discouraging is that so many basically good people ignored the early warning signs. As their rights were dissolving, they continued to hold hope that the situation was temporary and would lead eventually to a better Germany. Many of them eventually started turning in their neighbors for petty offenses and imagined insults. It was heartbreaking, and so preventable. I was also surprised to find how common and accepted antisemitism was in the United States. People in the US actually had some sympathy for the German “Jewish problem” because they viewed the US as also having a Jewish problem. And civil rights in the US were still criminally inadequate. It was hard for the US to complain about things that were happening in Germany when atrocities such as lynchings were still happening here. Dodd himself expressed some antisemitism. Dodd was also being actively undermined by political powers in Washington. I had much less empathy for daughter Martha. She embraced the whole German culture, turned a blind eye to anything that seemed disturbing, and seemed to value her numerous love interests over everything else. She came across as selfish and shallow, a thrill seeker with poor morals and less common sense. She certainly was interesting, though. I haven't read the author's other books, although The Devil in the White City is high on my to-read list. This one is well worth reading, a good story wrapped around a fascinating and horrible time in history. The book is very well written. A couple of the metaphors that the author used seemed jarring to me, but that is a minor thing. I prefer footnotes to the end notes that this book had, but that is also relatively minor, a formatting issue. Most importantly, I simultaneously learned from and was captivated by this book. I’ve read Erik Larson’s Devil in the White City twice, and also Thunderstruck; so when this book was offered on Amazon Vine, I jumped at the chance to read it. Devil in the White City and Thunderstruck are books that deal with crime; In the Garden of Beasts is a little bit different. In this one, Larson traces the story of the Nazis’ rise to power, from the point of view of an American diplomat and his daughter. William Dodd spent four years in Berlin, but this book focuses on the first year. In reality, the whole family went over to Berlin; but it’s the stories of William and Martha Dodd that are much more interesting. Dodd was an odd choice for the role of Ambassador; a former college professor, he was more interested in American history and getting his book written than in foreign policy. He wasn’t even Roosevelt’s first choice for the job! But Dodd was a very quiet, unassuming man, and his humility is what makes him so likeable. On the other hand, you have Martha, who, apparently, was quite promiscuous; a good chunk of the book deals with her romances with various men—not to mention the fact that she had a husband at home! There’s a tone of disapproval when Larson talks about her affairs, especially since many of them were with various members of the Nazi party. I think Martha was simply looking for affection and attention anywhere she could get it; and when a woman (or man) sleeps around the way that Martha did, there’s usually a deep-seated reason for it. It would have been interesting if Larson had explored that subject more, including the relationship between Dodd and his daughter. It is a compelling book covering a brief period of time from the early 1930’s to 1937-38. It highlights the ascent to power of one of the most diabolical minds of modern time and explains how and why he was able to assume the “throne” in Germany and attempt to annihilate the population of the world that was not purely Aryan. It was during this time, over a period of just over four years, that William Dodd served the government of FDR and moved to Berlin as the United States Ambassador to Germany. He was 64 years old and really wanted to remain in America, retire and complete his memoir, “Old South”, but he felt he owed it to his family and his country to accept. Living in Germany, with his wife, Martha, and two children, an adult son and daughter, both namesakes of their parents, William and Martha Dodd, he tried to warn FDR and the diplomatic staff about what he believed was coming down the pike, but was thwarted at every turn. He lived a humble life, not born with a silver spoon as most diplomats were and was the object of their scorn and ridicule; his attempts to warn the government about the horrors in Germany, were often undermined by the others in the diplomatic corps. His brief sojourn pretty much sucked the life from this well-meaning, but ill-equipped, sincere representative of the government. His prescient remarks, often laughed at, proved to have been correct, and if heeded, might have altered the turn of events and prevented the genocide that occurred as Hitler attempted to rule the world. From the prologue, the author had me. I had assumed the history of Hitler’s Nazi Germany might be a bit dry, but not so, this book is liquid, fluid, hot lava…igniting my thoughts and my interest. I think the writing style and organization will be less important, in the end, than the information and message delivered, however, both are superb. The book takes place predominantly through the period of 1933-1934, although it does extend in the last few dozen pages into 1937-8 very briefly. Wiliam Dodd was a mild mannered academic and gentleman who was asked by FDR, to be Ambassador to Germany in 1933, almost as a last resort, because no one else would accept the position in a country many believed was undergoing a radical change, with increasing violence, under the leadership of the new Chancellor, Adolf Hitler. Already, in that early part of the decade of the thirties, the evil and brutality of Hitler and his thugs was well known but kept hidden for political and diplomatic purposes. The leaders of the free world would soon rue their decisions not to challenge him when they had the opportunity. Dodd was naïve and largely unaware of the daunting task before him, as he set sail on July 5, 1933. He did know, however, that anti-Semitism was commonplace and acceptable in many places in our country, as well as abroad; his instructions were basically to do what he could to alleviate the brutality against them but not to interfere in the overall German policies toward Jews. William Dodd remained in character: bookish, professorial and also naïve. He was improperly briefed as to what to expect. The evidence of Hitler’s atrocities and madness, were only beginning to show themselves and they were not obvious in the center of major cities but rather in outlying areas. Jews were in small numbers in major cities, but already there were laws governing their activities and employment. The ambassador, in typical liberal academician fashion, sought to allay the fears these demonstrations aroused and to spin the stories so that they were not so unfavorable, but were rather aberrations. He even tried to quell them entirely to keep them from the public eye. He believed that the horror stories he was told about how Jews were treated were grossly exaggerated and also believed that it was not the job of the United States to be involved. He believed diplomacy was the only way to deal with problems. At first, he did not believe in making waves. Eventually, Dodd realized that his misgivings about Germany were growing, and he could no longer dismiss the brutality of Hitler and his henchmen, but it was already, too late; the train had left the station and the Holocaust was inevitable. This book has been making the rounds of the must read lists including Oprah's summer reading list. I am already a fan of Erik Larson having read The Devil in the White City which contains the single most haunting scene I've ever read when he describes the outline of a poor murdered girls footprint on the locked door of the room she was gassed to death in. Thinking of that scene still gives me chills. I knew I would enjoy his latest effort. This book looks at the rise of the Nazi party at the end of World War I through the eyes of the American ambassador to Germany, William Dodd and his daughter Martha. I thought I knew a lot about this topic but I learned so much more. For instance Hitler was vegetarian! The man who would go on to be responsible for the death of millions of people wouldn't hurt animals. In fact the animals of Germany were treated a lot better than the humans. This book did a good job of explaining why America and really the rest of the world turned a blind eye to the atrocities that were occurring in Germany. It turns out that America was more concerned about getting repaid for the war bonds from Germany and was willing to let a lot slide in order not to rock the boat. Before I read this book I knew that the Nazi's were bad but I really had no idea the depth of horror that they inflicted on people. No one dared to stand up to them because by the time they realized what was happening it was too late. Anyone who tried to stand up to them was made an example of as was their family. People were paralyzed with fear.I found it helpful to read further on the internet about the many people, places, and events that were touched upon in this book. For instance Larson briefly touches on Action T4, Germany's plan to euthanize all the people who they felt were undesirable. The headquarters were located in the same neighborhood that Dodd lived in. What I learned about that program gave me nightmares. The cruelty done to innocent ,sick people, especially children made me physically sick. In fact anytime the Nazi's wanted to test something out, they just rounded up children to experiment on. The few people who tried to speak out against the crimes against humanity were either not believed or silenced with murder. The book ends with the Night of long knives in which Hitler ordered the death of anywhere up to a thousand of his former friends. At that point Hitler was free to proceed with his reign of terror without fear of opposition. In 1933, William E. Dodd, an unassuming history professor from the University of Chicago, and certainly not FDR's first (or even 5th) choice, was named Ambassador to Germany. He packed up his family (his wife, his under-achieving son, and his promiscuous daughter) and his battered family Chevrolet and headed to Hitler's Germany. At first he thinks that he can reason with the Nazi officials he encounters, just as his daughter thinks she can romance them much as she did the boys back home. Both assumptions are horribly incorrect. As Dodd becomes more familiar with the horrors of the Nazi regime, he tried to warn the President and a mostly disinterested State Department, both of whom were more concerned about collecting Germany's war debt than addressing the shredding of civil rights in that country. His daughter, Martha, also becomes disenchanted with her Nazi lovers and veers to the other side of the political spectrum with an affair with a Soviet diplomat who was also an NKVD functionary. This is a tremendous book by the author of The Devil in the White City. It tells of the years spent in Berlin by an American professor of history from the University of Chicago, William Dodd, who served as our ambassador to Germany, and his family. At a time when seemingly no one wanted the job, Dodd agreed because he thought it'd give him plenty of time to complete his magnum opus on the history of the American South. Instead, he found himself wrapped up in the early days of Hitler's rule as an ambassador, a job ffor which he was thoroughly unsuited. Written with a liveliness and an ease that made this book read almost like a novel, it is fascinating in several different ways, first for its glimpse of everyday life and life among the upper echelons in 1930s Germany (the book focuses mainly on the first year of Dodd's ambassadorship, 1933-1934). Secondly, the insights into the life of an ambassador were extremely interesting, particularly when that ambassador met Hitler and other Nazi leaders. Now this might all sound a bit dull but I assure you, it was not. Dodd chose to take his family with him. His daughter, Martha, a 20-something seemed to have numerous affairs. Before the family moved to Berlin, Martha had an affair with poet, Carl Sandburg. She was a good friend of Thornton Wilder and, in fact, kept a photo of Wilder in her locket. Once in Germany, she had an affair with Nazi who was the head of the Gestapo. In fact, incredibly, with all the political infighting and constant danger surrounding high level officials, that Gestapo head wanted to be seen with Martha because it afforded him more protection. Martha also had an affair with a Russian man from the embassy who was encouraging her interest in all things Soviet. For me, the parts involving Martha and all the events swirling around here were the most interesting part of the book. I'd love to track down a book entirely about her. Yes, we have another apocalypse building, but this one was does not involve zombies or vampires but an equally terrifying threat: the Nazi party. Early in 1933, William Dodd was perfectly content, working as a history professor in Chicago, leading a quiet and humble life. This all changes, when he is chosen to be the new ambassador to Germany. He accepts and soon relocates to Berlin, along with his wife and his son and daughter, both in their early 20s. Eh. A quick pop-history look at the early years of the Third Reich. Lots of interesting characters are kept in the background, and only shown in little bits. Journalists, Reichsministers, and tyrants all shown too briefly. At least the book got me interested in finding out more about these ancillary figures. With the full knowledge of time this is a horror story. Thinking that so much of the Nazi's evil deeds were ignored and the destruction it eventually brought about is a horror! Dodd was actually Roosevelt's third choice for the job of US ambassador to Germany in 1933,the dawn of the Hitler reign. He was an intellectual,a Jeffersonian Democrat,a southern gentle man and a patriot in my opinion. In addition to having to battle the insanity of the Nazis he also had a constant battle with our State Department and various cabinet members in our country. They all also seem to turn a blind eye and a deaf ear to what was happening in Germany and made little of Dodd's information relayed to them. The arrogance of these white,social register,ivy league educated men in astounding. They say people do not change but knowing what both my grandfather's from this generation were like and watching Life With father,the old movie, I think some men have actually improved somewhat! Much of the book is written about Dodd's attractive flirty daughter,Martha. At first she thinks the new Germany is grand but after living there for about a year and seeing some things with her own eyes this opinion eventually changes. Martha had many relationships while in Germany that include high ranking Germans and a communist. The family experienced the terror of living under scrutiny for most of Dodd's service. In scene after scene in the book it did not make a bit of difference even if you were an American citizen during these years.